Saratoga Jewish Community Arts concludes its 2018 -2019 season with The Thomashefskys, Music and Memories of a Life in the Yiddish Theater, sponsored by Temple Sinai and presented through a generous grant from the Jewish Federation of Northeastern NY and the Golub Corporation. Like most of the people who made it what it was, the American Yiddish Theater was born in Europe but found its greatest success in America. In this film you will hear the music of shows that played in the theater houses of the Lower East Side in New York and other American cities to which the Thomashefsky troupe traveled in the late 19th and early 20th centuries. To say these are rescued lost treasures is not an exaggeration. 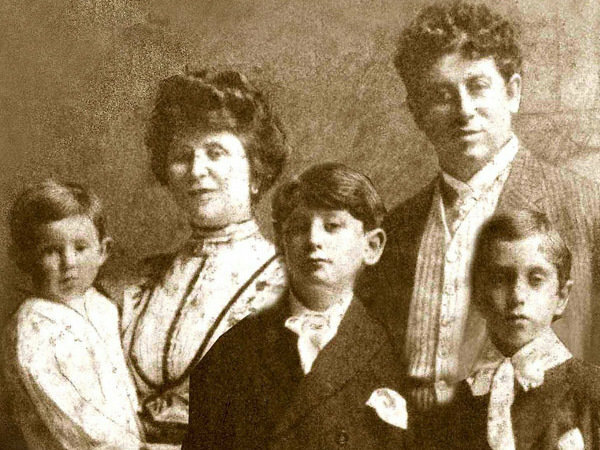 For ten years, The Thomashefsky Project, founded in 1998, expanded from an archival role to a stage production conducted by Michael Tilson Thomas, the grandson of Boris and Bessie Thomashefsky. The Thomashefsky Project searched out, reconstructed, and preserved the disintegrating scores. Michael Tilson Thomas had a dream to preserve the music of the Yiddish theater and to celebrate the lives and theatrical and musical legacies of his grandparents. The fragments of musical transcripts discovered at various archives were pieced together and contained little or no annotation. Thomas brought them to life, editing and arranging the material according to his memory of how his grandmother, grandfather, father, and uncle performed the numbers in the living room of his family home in the 1950s. When The Thomashefskys premiered at Carnegie Hall in April 2005, several members of the audience commented that the music didn’t “sound Jewish.” This response may be due, in part, to the emotional response nurtured by Fiddler on the Roof, Broadway’s projection of Sholom Aleichem’s village of Anatevka, and to contemporary klezmer arrangements. It may also be due to unfamiliarity with the basic nature of Jewish music, a secular and sacred heritage in development since early post-Biblical times. The Ashkenazic Jews (Eastern European), in particular, created a rich body of melody. They developed liturgical music with Hebrew and Aramaic prayer texts and, in all areas where Jews settled, their minstrels mingled with other music-makers, borrowing and adapting elements from each other. These traveling minstrels, called badkhonim (literally, ones who concoct, create, make known), were folk educators as well as entertainers, and sang Yiddish songs imbued with meaning. As conditions grew harsher in Tsarist Russia, their songs took on qualities of consolation and counsel. The program, brought together by Michael Tilson Thomas for The Thomashefskys, enables us to travel the expanse from the birth of Yiddish theater credited to Abraham Goldfaden in Romania in 1876 (where he set out to create a type of Jewish opera or operetta) to Joseph Rumshinsky, the most prolific and influential of the operetta composers who lived through the transition from the older European-based plots and musical styles to the advent of the lighter Americanized shows that set popular taste in the 1920s; to stand on the threshold where sounds of Jewish music entered mainstream American life and gradually evolved into something new.